Here’s what happens when you put race car engineers on the drag strip. 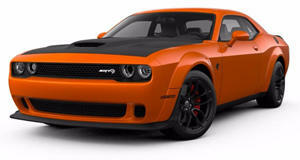 Thought talk about the Dodge Challenger SRT Demon would be over once the reveal date had passed? Well, sorry, we’re almost there but not quite yet. That’s because, aside from pulling off one clever marketing scheme by keeping the Demon in everyone’s mouths prior to the unveiling thanks to a series of teaser videos, Dodge actually delivered on the car, making it one of the more exciting reveals of 2017. Unfortunately, there still seems to be a lot of confusion around its special features. Car and Driver attempted to consolidate all the facts surrounding the car into a concise list because like a blathering overly-excited kid remarking at every attraction during their first visit to Disneyland, Dodge executives and journalists alike had a hard time dispensing the gobs of information on unique Demon-only features to awaiting fans. Among the lesser known bits of hardware are the Uconnect performance pages, which is not a feature unique to the Demon. What is different is the readout for intercooler temperature, shift lights that are adjustable for each gear, a launch control system that can be tuned to slingshot off the line while holding RPMs to a preset level, and a control for the burnout feature. Of course, this isn’t as obvious as some of the extreme weight-loss tactics Dodge used on the Demon, such as deleting the rear bench and front passenger’s seat (which can be added back into the car for one dollar a pop). Gone along with the seats is the trunk trim, sound deadening (why muffle the V8? ), the sound system and speakers, parking sensors, power steering column adjustment, smaller rotors and simplified brake calipers, and larger rims. While the overall effect of removing or swapping out some parts is a net loss in weight, some of that is done to make up for the weight of the reinforced drivetrain, which includes larger-diameter axle shafts with more splines as well as a stronger differential housing and upgraded driveshaft. This is much needed given that the Demon likes to unleash its 840 horsepower in a violent way, eschewing manners in favor of high G launches. Aiding that is the Trans Lock, which engages both the first and reverse gears while the driver is waiting to launch so that the car won’t move. During that time, the two-step ignition system engages Torque Reserve. At this phase, the driver has sandwiched the throttle between the firewall and their foot. Torque Reserve acts by stoping the flow of fuel and retarding spark to four of the eight cylinders while closing the supercharger’s bypass valve so that boost can build without max power hurting the locked driveline. One flick of the paddle shift reengages the deadened cylinders instantly and sends the car and driver towards the horizon. At this time, the Demon’s drag suspension setup comes into play. Softer springs and stiffened rebound, at least up front, helps the front end lift and the rear squat, juggling the power in a manner most conducive to translating the engine’s twist into forward momentum. Behind the scenes there is too much at work to consider when attempting the launch, so just make sure the four-point harness is tight and the wheels are pointed forward while the Demon does the rest of the thinking.